Winter is synonymous with soup – am I right? I love making a big batch on Sundays to last the week, and find myself dipping in for a hot cup as a mid-day pick-me-up. It’s more affordable than buying at a local cafe, and when you cook at home, you know exactly what’s inside. Seemingly healthy soups like a creamy mushroom or broccoli make us forget about the empty calories hidden inside (I’m not saying heavy cream isn’t delicious, but I’m also saying it’s not doing us much good). I believe good food heals and can taste good, too. And when I’m cooking at home, I love the challenge. So whether you’re fighting through cold and flu season or crave soup all winter long, I’ve got you covered. 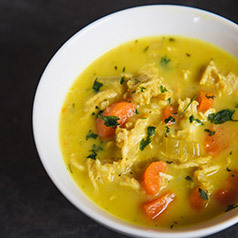 This creamy chicken and “rice” soup uses a few simple tricks to add more healthy, healing benefits with anti-inflammatory ingredients and tastes pretty darn good, too. Use coconut milk instead of heavy cream. Coconut milk adds a rich, creamy texture and depth of flavor to soups. If you’re doing the Whole30 or cutting out dairy but still want a creamy base, keep a couple of cans of coconut milk in your pantry (they have a great shelf-life, too). Keep in mind, while coconut milk is considered a healthy fat and packs more nutrition than other cream bases, it’s still high in fat (PSA: do not use “lite” coconut milk as you will not get the same creamy texture). I like to use a 50/50 split of bone broth and coconut milk for my soup bases. Swap out white rice or noodles for cauliflower rice. Traditional chicken soups use white rice or noodles to bring texture and leave you full. Swapping out noodles or rice for cauliflower rice is an easy way to add more vegetables and nutrients without losing the composition in the soup. You may have heard of anti-inflammatory diets. So what’s that all about? Chronic inflammation can lead to weight gain and diseases like diabetes, cancer, arthritis, and heart disease. Inflammatory foods include processed meat, artificial sweeteners, added sugars, fried foods, dairy, alcohol, and other usual suspects. But just like foods can cause inflammation, foods can fight inflammation, too. Anti-inflammatory foods help us stay healthy and can even help cure. Turmeric takes a leading role in this chicken soup recipe. It’s known to cure colds, fight infection, and reduce inflammation. It’s flavor pairs nicely with the coconut milk for a more complex taste than a bowl of traditional chicken soup, and its brilliant yellow-gold color makes the dish beautiful to look at, too. The coconut milk, cauliflower, carrots, celery, and bone broth each bring their anti-inflammatory properties to the party – all working together to keep you on your feet and feeling your best this winter. *You can use regular chicken broth, but I love the nutritional benefits and depth of flavor you get from using bone broth. Melt two tablespoons butter in a large pot. Add diced onion and saute for a few minutes. Add sliced celery, carrot, and minced garlic and saute until vegetables become tender-crisp. Pour in two cups of chicken bone broth, turmeric, thyme, onion powder, salt, pepper. Bring to a slow boil, then reduce heat to medium or low for a simmer. Place the chicken breasts into the vegetables and broth. Cover and simmer for about 10 minutes or until the chicken is close to done. The cook time is dependant on the thickness of the chicken, so I like to check mine as I go. If you’re looking to speed things up, you can cut the chicken breasts in half before cooking. Once the chicken is nearly cooked (no longer pink in center), remove from broth and shred using two forks. Place shredded chicken back in the broth. Add the frozen cauliflower rice and stir to combine. Pour in the can of unsweetened coconut milk and simmer allowing all of the ingredients and flavors to combine. The longer you simmer, the deeper the flavor, but this is ready to eat once the cauliflower rice is hot and the coconut milk is completely combined. Garnish with parsley when serving, salt and pepper to taste, and enjoy! Tip: You can make this soup Whole30 compliant if you use ghee instead of butter.